The sister of a missing man has joined police in revisiting the streets where he was last seen almost three months ago. 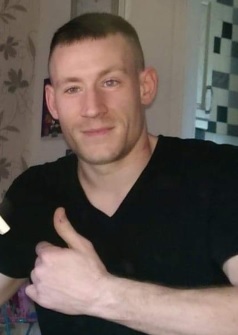 Father-of-two Tom Graham, 30, of Glasgow, was reported missing by his sister on Monday November 26. He was last seen by her in Govan in mid-October and is last thought to have been seen by a friend in Edinbeg Place, Toryglen, on Saturday October 27. Police Scotland officers revisited Toryglen on Wednesday to speak to people and gain any extra information they could to help find Mr Graham. They were joined by his sister Sarah, who handed out missing person leaflets to jog people’s memories in case they have seen her brother in the area. Mr Graham is around 6ft, with a medium/muscular build. He has several distinctive tattoos, including the name Sophie on the right side of his neck, an image of a black panther on this right calf and a tattoo on his right forearm. He also has a birthmark on the left side of his neck. Officers said it is usual for him not to be in regular contact with his family, although not for this length of time. He is known to visit various areas of Glasgow including Govan, Toryglen and Drumchapel. Appealing for information, Chief Inspector Shaheen Baber, the area commander for Govan, said: “Tom has been missing for almost three months now. “Christmas has passed and he was not in touch with his family, including his two children. “This is extremely unusual and family members are increasingly worried. He added: “I would also appeal to Tom directly to please get in touch with someone to confirm that he is safe and well.